People like this movie a lot. But it’s more annoying than anything else. A bog standard eighties comedy. Nothing special. It’s difficult to pinpoint what makes this film as loved as it is. It has that 80’s nostalgia going for it. 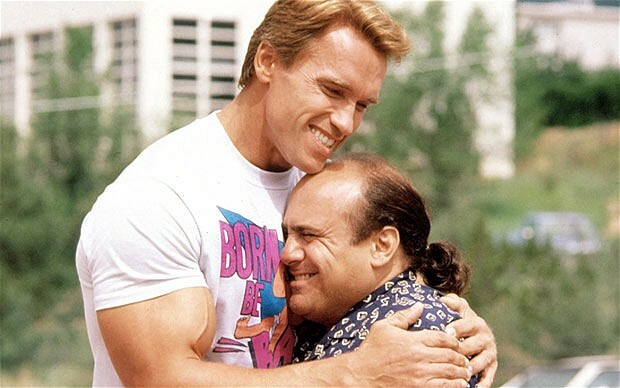 But it’s that other De Vito/Schwarzenegger team-up that doesn’t make sense. At least this one is fractionally better. With the two playing twin brothers who were separated at birth, there is room for laughs aplenty. There have been announcements for a sequel called Triplets. It will feature Eddie Murphey as the long-lost, third brother. Presumably this isn’t something people want to see. Sounds just as irritating as Twins. But one can not ignore how much love there is for this film. If not for that this film would have found itself listed much lower. Arnie’s big return to playing the leading man in an action flick was underwhelming with critics. This film isn’t anything special. But by no means is it bad. It features really nice throwbacks to Arnie classics, some nice comic relief, and some fun action set pieces. It’s not trying to be unique, it’s trying to be a throwback to old-school action films with a modern flavor. And it does the job. This might be why the film wasn’t received well. It felt somewhat dated for a modern film. Too similar to the action movies of yesteryear. There are some pretty terrible choices in the dialogue too. But that shouldn’t stop you enjoying this film. It’s a good excuse for great Arnie action, albeit a little watered down. Forest Whitaker delivers a good performance, and he can always hold a film together. Luis Guzman and Johnny Knoxville bring the laughs. And they both share good chemistry with each other and Schwarzenegger. It’s quality Arnold fun. Arnie financed this project and pushed for its development. It’s a sharp little film. Got some very clever ideas. It feels like Arnie was pushing for another successful sci-fi action film. It’s a formula that always spells success for him. This film didn’t make much money, but it’s commercial success doesn’t reflect how enjoyable this film is. With twists and turns in the plot that keep you guessing until the last, it’s well worth checking out. It’s currently on Netflix, so there’s no excuse. It’s a must watch for all Arnie fans. And a must watch for sci-fi lovers. There are conspiracies, murder, clones, lasers, self-driving cars and more. It does feel a little 80’s/90’s in its set design. And it does slightly undermine how good the concept is. But there is excellent action to keep you hooked. There is something annoying about lasers in this movie. Something doesn’t feel right in how the beams drift through the space between blasts. But the story is slick. And Arnie gives a mature performance. One of the better examples of 2000’s Schwarzenegger. This film was a surprising treat. What looked to be a generic excuse to get Stallone and Schwarzenegger together from the trailers, actually turned out to be a decent little film with an intelligent story to boot. Stallone plays a guy whose profession is to break out of prisons to test the security. He gets hired to go to the highest security prison in the world, but it turns out to be a setup. No one knows he’s in there. 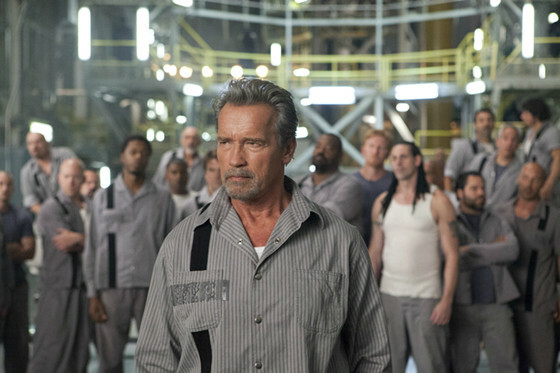 He befriends Schwarzenegger, and they team up to get each other out of there. It’s good. Better than expected. A good quality performance from Stallone. But the highlight of the film is a brief glimpse at how excellent Arnold could be with the right role. There is a moment where he stages a nervous break down to distract a guard. It’s like someone didn’t tell Arnold that its only a distraction. He goes for it. He starts crying out in his native Austrian tongue. He’s really good in this scene. Arnie really gets to shine as an actor here. The man needs a role he can sink his teeth into. Something that can prove his relevancy continues. This won’t go down as a classic action movie. Nor a classic Arnie movie. But it’s a great film that shouldn’t get forgotten about, and one of the better Arnold performances. Good, clean nineties Arnold. This was a very commercial period in Arnie’s career and Eraser was an easy choice for studios to put out. 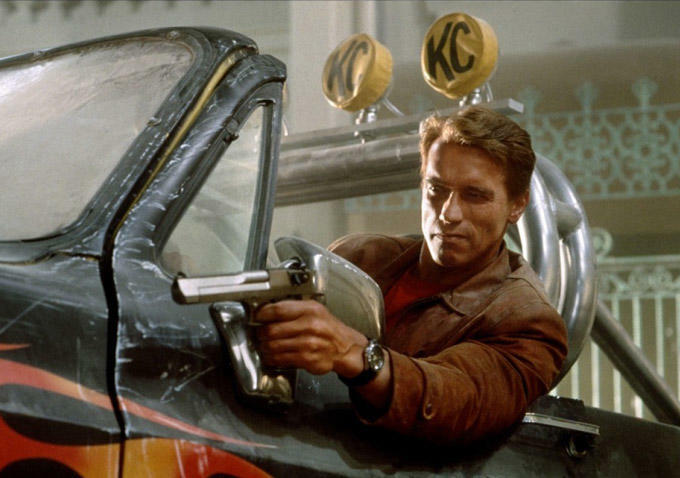 An Arnie vehicle, with an established actor playing the antagonist. James Caan. Who is excellent in everything he is in. Unfortunately, everything he’s in isn’t always as good as his performances. That’s not the case with this film. There’s a lot of fun to be had with this one. It’s not great, but it’s Arnie at his best. There are some great weapon designs in this film. A needle grenade launcher, an x-ray gun. It’s the sort of Arnie film that dads love. Plenty of action. Plenty of explosions. Sure, it’s not one of his more memorable movies, but it showcases what makes an Arnie film so enjoyable. It’s a shameless thrill-fest. A perfect 90’s popcorn action. Featuring conspiracy, state of the art weaponry falling into the wrong hands, and Arnie kicking a GGI crocodile in the face. It’s very watchable. A film that shouldn’t be taken very seriously, but it does have a 90’s charm about it, that makes it very watchable. This is another Arnie movie aimed at children. Following the exploits of a youngster who has gained the ability to jump into films, as he explores the world of his favorite action franchise, Jack Slater. Arnie doesn’t hold back on the self-referential gags in this film. Enough to put Deadpool to shame. There is a great scene where the kid starts daydreaming in a class focusing on Shakespeare. He creates a trailer in his head for an action-fueled version of Hamlet, starring Schwarzenegger. This is the best part of the movie for sure. It’s great. Good enough that Arnie should consider doing a tongue in cheek version of Hamlet. Megadeth provides a very 90’s soundtrack, and it couldn’t be better. There is so much to enjoy in this film. Charles Dance of all people plays the central antagonist to Arnie. Ian McKellen makes an appearance as Death. Even Arnie gets to play himself in a scene, arguing with himself. It’s corny. It’s self-reflexive, fully aware of the genre it’s referencing. It has great gags and even better action. Certainly a good giggle for everyone. A perfect Christmas movie that’s fun for the whole family. This generation will forever see Jingle All the Way as sufficient nineties nostalgia feed. It’s very charming. There’s always something sweet about Arnold when he plays a family man. And by this time he had honed his comic timing with films like Twins and True Lies as practice. Every parent can relate to Arnie in this movie. Every parent understands the stress of not getting the perfect gift for their child for Christmas morning. Arnold has left it until Christmas Eve to get his son the most sought-after gift of the season. A Turboman doll. The film follows him desperately searching for the gift at the last minute. 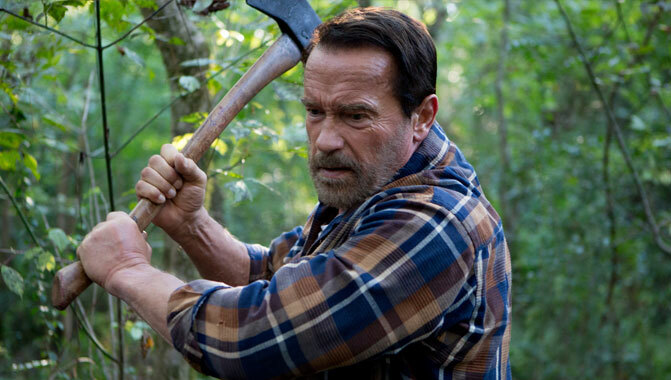 Naturally, there are some action scenes thrown in for good measure, it is a Schwarzenegger picture after all. 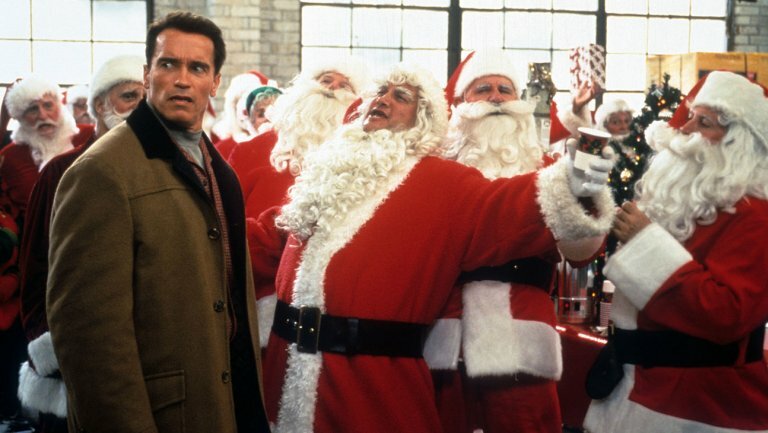 It’s never truly Christmas until Arnie has punched up a gang of fighting Santas. Also featuring one of the last performances from Phil Hartman, the voice of Troy Maclure in The Simpsons, before his untimely death a year later. One of the better Christmas movies of the era. He’s fought the military, terrorists, and cartels single-handed, killing machines, and advanced alien species. Naturally, the logical next step is for him to fight the Devil. And he does. With guns. And booze. This film sounds worse than it is. But it’s surprisingly really well put together. 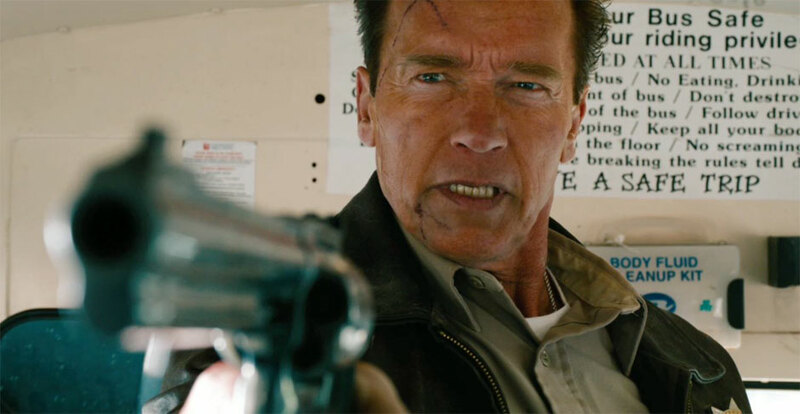 Arnie plays an alcoholic, ex-cop, bodyguard, whose family were murdered. He has no ambition or hope. He just trudges through each day, missing his family. He is told a warning from a priest who attempted to assassinate a man, and then promptly kills himself, but he had no tongue. This sends him on a journey, discovering the truth about the impending rise of Satan. Arnold is pulling out a good performance in this flick. There is a real sense of despair and loss in him. This is one of the better Schwarzenegger performances you will see. Also a very tight performance from Gabriel Bryne, as the embodiment of Satan. The special effects aren’t awful, but considering this came out the same year as The Matrix, they could have been much better. A very nineties movie indeed. An undercover cop in a school, having to deal with small, annoying children. It sounds like the making of a dreadful film, but this movie has some seriously authentic laughs. You instantly fall in love with this film once you see the scene when Arnie argues with a small child about whether he has a brain tumor. It’s adorable. It’s certainly a marker for how the tone of Arnie’s movies shifted in the nineties. It was a time for the lighthearted Arnold. A ‘child appropriate’ Arnold. It’s certainly a huge contributing factor to why Arnold isn’t just loved by dads, but by all the family. He was now a blockbuster star, not an action star. He was transcending to a household name. This film is well loved by many. And it’s hard not to like this movie. It’s not a great movie by any means, but it holds a strong place in the hearts of a generation. A newer film in Arnie’s filmography. A unique and somber take on the zombie genre. Arnie actually loved the script for this movie so much that he participated without a fee. It’s certainly an interesting film and not the sort of flick you’d expect to see Arnold in. It’s not an action movie nor is it a horror. It’s actually an apocalyptic drama, dealing with more human issues and focusing on characters, rather than action set pieces and zombie attacks. Any high octane moments are short-lived and quick. It’s fresh and certainly worth a watch for zombie or horror fans. It’s a zombie film with some serious heart. The film centers on Arnie, who spends the film debating with himself how to deal with the recent zombie infection of his daughter, played wonderfully by Abigail Breslin. In this film, the progression into zombification is a slow process, and the debate carries on until the last frame of the movie. It’s also about Breslin dealing with the inevitable fate that awaits her, and she doesn’t have long to enjoy the rest of her life. It’s a very depressing movie. Much more depressing than your average zombie movie. But it really is excellent. Worth a recommendation.